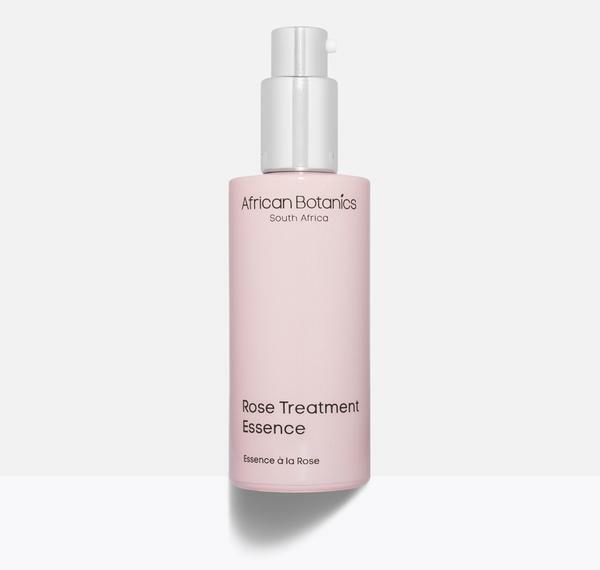 African Botanics Rose Treatment Essence (Review Forthcoming) is a unique multi-functional treatment gel that melts into a toning hydrating liquid upon application. Designed for all skin complexions, this intensely concentrated formula helps detoxify cells, tighten pores and restore moisture levels while brightening, refining, hydrating and rebalancing skin's pH levels. Yeast Oligosaccharides, derived from Blue Agave plant and Calendula Flower - Increase Hyaluronic Acid production, restore the skin’s ability to attract and retain water, resulting in more supple, plump skin. Di- and Tripeptides protect the skin from nutritional deficiencies and improve the barrier function. the skin is left more radiant, smoother and wrinkles are reduced. Synergetic Botanical Complex - Maintains water at the skin surface, slowing down water evaporation from the stratum corneum area and improving skin’s micro-circulation. Mallow Flower Extract, Ivy Extract, Parietaria Officinalis Extract, Cucumber Fruit Extract, Sambucus Nigra Extract and Arnica Montana Flower Extract. Vitamin B3 (Niacinamide) - Reduces water loss by 24% in 4 weeks, boosts Fatty Acid and Ceramides by 67% and 34% respectively; stimulates new Fibroblasts by 20% and Collagen secretion by 54%; inhibits pigmentation by 68%. Vitamin B5 - Penetrates deep into the lower layer, works as a humectant by infusing water in to the cells, retaining moisture deep within the skins tissues. Green Coffee Extract - extremely rich in antioxidants, helps shield the skin from free radicals. Green Coffee, Nettle, Ivy, Mallow, Pellitory, Witch Hazel, Pine Cone, Cucumber and Chamomile. Oh, it really is utterly extraordinary, Allison! Definitely worth the splurge! This sounds like it has amazing ingredients. It really does have the finest ingredients! I love a rose scent! I'd probably like this one! You would be thrilled by this, I am sure of it!